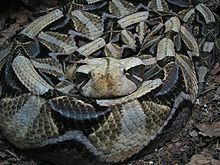 Bitis gabonica - Wikipedia, entziklopedia askea. Bitis gabonica Bitis generoko animalia da. Narrastien barruko Viperidae familian sailkatuta dago. Saharaz hegoaldeko Afrikako sabana eta oihan-tropikaletan bizi dira, eta beste sugegorri guztiak bezala pozoitsua da. Bitis generoko kiderik handiena da, eta hortz luzeenak ditu, 5 zentimetro artekoak. Inongo sugek baino pozoi gehiago du. Ez da azpiespezierik ezagutzen. ↑ W., McDiarmid, Roy (©1999-) Snake species of the world : a taxonomic and geographic reference Herpetologists' League ISBN 1893777014 PMC 42256497 . Noiz kontsultatua: 2019-02-22 . ↑ 1953-, Spawls, Stephen, (1995) The dangerous snakes of Africa : natural history, species directory, venoms, and snakebite Ralph Curtis-Books ISBN 0883590298 PMC 33833647 . Noiz kontsultatua: 2019-02-22 . ↑ 1955-, Mallow, David, (2003) True vipers : natural history and toxinology of Old World vipers (Original ed. argitaraldia) Krieger ISBN 0894648772 PMC 51258218 . Noiz kontsultatua: 2019-02-22 . ↑ «ITIS Standard Report Page: Bitis gabonica» www.itis.gov . Noiz kontsultatua: 2019-02-22 .